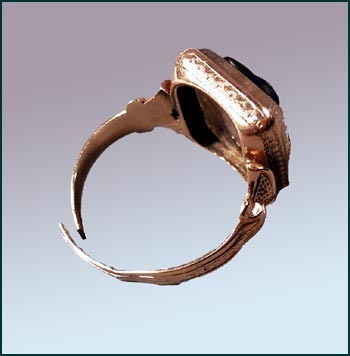 Just as the relics of peoples' lives enliven the collection, so do artifacts of their deaths. Ships and their people have forever threaded between three titanic elements: earth, air, and water. The thread was often snapped by one or a combination of these forces. The spectacular horror of vessels torn apart within sight of those on land, unable to help, is but a small portion of the greater un-witnessed toll, of ships that simply never came back, their fate swallowed by the vast abyss. The gap between letters home, so long in coming, stretched until finality had to be painfully admitted. No farmer's tan line across his forehead, the capable gaze of a young Capt. Harvey Mills of St. George, Maine twinkles just a bit in this detail from his ca. 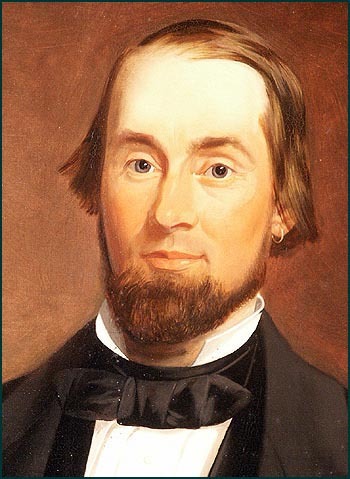 1847 portrait. A captain at 25, he survived Cape Horn many times in his long career, entitling him to wear the traditional Cape Horn-er's gold earring, that also twinkles here in contrast to his formal black cravat. Tradition also has it that the mariner's gold earring was to defray the cost of his funeral, assuming that his body was ever found. 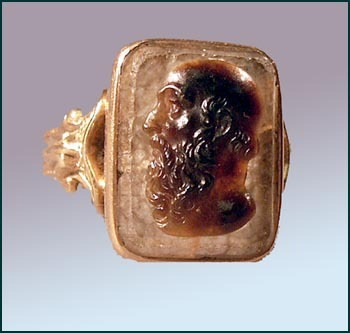 This agate cameo ring with a bust of a classical figure, possibly Diogenes, was cut from the finger of Capt. William Willey before his burial in Thomaston. His body had been shipped home in a brandy-filled lead casket, where it had been recovered from the wreck of his ship, the Alfred D. Snow. Laden with Australian grain, she was driven ashore at Broomhill, County Wexford, in the River Suir estuary below Waterford City on the south coast of Ireland, January 1, 1888. Other crew were buried locally in Ballyhack; timber from the wreck was salvaged by local residents. 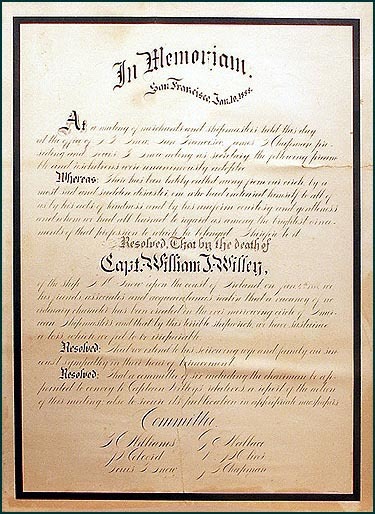 Long before Willey's body was returned to Maine, in fact within ten days of the wreck, informed through telegraph lines that reached halfway around the world, his business associates in San Francisco had drawn up the Memoriam document below, dated January 10, 1888. Despite their, to us, excruciating formality of language, the well hidden grief of these Victorian captains of industry and vessels can still be discerned. They are mourning the only way they know, bereavement by committee. 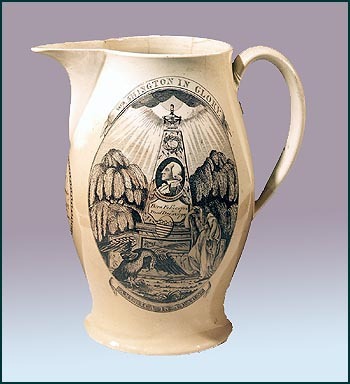 "Whereas: There has been lately called away from our circle by a most sad and sudden disaster one who had endeared himself to all of us by his acts of kindness and by his uniform courtesy and gentleness, and whom we had all learned to regard as among the brightest ornaments of that profession to which he belonged. ... that a vacancy of no ordinary character has been created in the ever narrowing circle of American shipmasters, and that ... we have sustained a loss which we feel to be irreparable. Resolved: That we extend to his sorrowing wife and family our sincerest sympathy in their hour of bereavement. Resolved: That a committee of six including the chairman be appointed to convey to Captain Willey's relatives a report of the actions of this meeting: also to secure its publication in appropriate newspapers." Death also dogged those whom the mariner left behind. "Dear wife: Have this moment your letter saying our dear little baby boy is dead. Poor little chap never knew he had a papa, and his papa has never seen his baby boy. I wish I were there, dear, to help you in sorrow. I know you loved him and so did I though I never knew him. He was my boy and our dear baby. Keep a good heart dear until I can sometime come and help you. I know you kissed my boy for his papa before he was laid to rest. Your loving Charley." Cassie and Charles corresponded almost daily through their 32 year marriage whenever he was at sea or waiting to turn around in distant ports, which was most of the time. Though their first child was born at sea, she remained ashore to raise the next three. 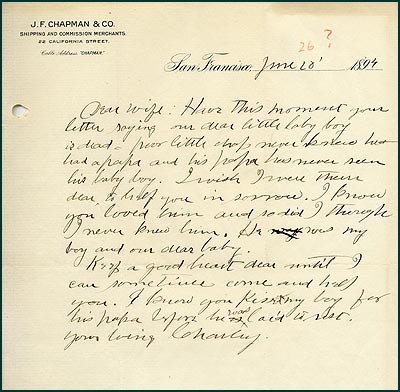 Her relieved letter to Charles informing him of the successful birth of his second, a daughter, was tempered by the loss of her two brothers who had shipped together on the same vessel, contracting a fever in Central America. This un-named fifth child seems to have succumbed to typhoid in Maryland. She lost Charles in 1916, when, at age 71, he was swept off his schooner by a shifting deck-load of hard-pine lumber during an October hurricane, while headed toward the Italian Front from Pensacola. This small ca. 1850 portrait of Olive Titcomb Pote has retained its charm despite the underlying wood panel wearing through. She was born into one and married into another sea-going family from Falmouth, Maine that were shuffled by the hand of Death for three generations. 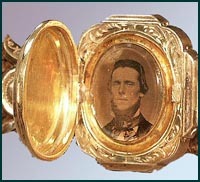 The wrist locket belonged to Olive, and has a strap of woven human hair, conceivably hers, and opens to an early photographic portrait of her husband, Capt. Samuel Pote, whom she accompanied at sea for several voyages. Her father died of yellow fever in Havana in 1854, while master of a brig, the Montrose. In the same year a younger brother shipped for Le Havre, but vessel and crew were never heard from again. 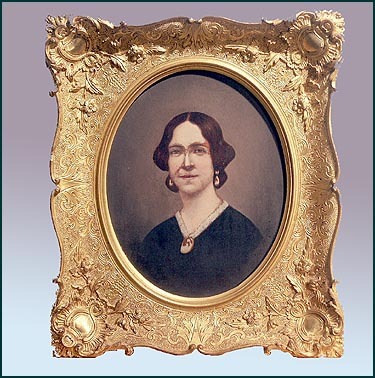 Olive died in childbirth in 1862, age 36. Her widower, Capt. Samuel, re-married the widow of her lost younger brother. 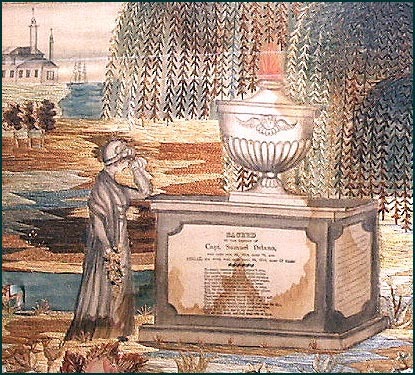 A captain's daughter embroidered this memorial ca. 1825, "Sacred to the memory of Captain Samuel Delano, died 1814, age 76, and Abigail, his wife, died 1811, age 69. ... Then rest, dear shades, since death has burst the ties, and wing'd the souls to more congenial skies. ... Peace to thy dust ..."
The needlework surrounds a printed block of text and verse, with finer details in pencil. The bright colors of the stitches have faded only slightly. This daughter, "the orphan, in this vale to roam," was to marry and survive another Bath captain, losing two young daughters on the way. She crafted a second needlepoint piece to their collective memory. She may have taken cold comfort in that everyone in her family died on land; as a mariner's daughter and wife she well knew that the last sight of a seagoing loved one was so often the view that she penciled into her background, that of a ship heading toward the horizon. 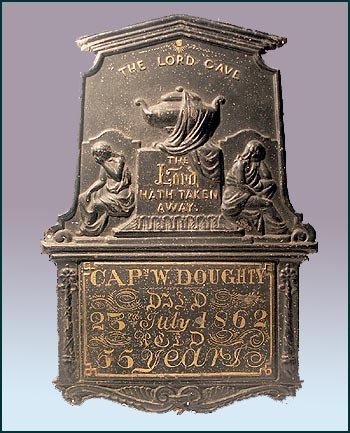 Pressed tin memorials were used as temporary grave markers until a more permanent stone was completed. The age of this captain, "55 years", seems on the young side for 1862, but we do not know if he died at sea. As death moves away from the sting of the personal, it becomes a different sort of beast. Our fascination with the death of others reaches new realms when a famous personage departs this world. Whether for Nelson, George Washington, or Elvis, the memorial act involves objects of popular culture. 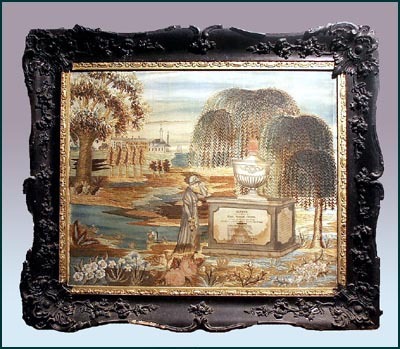 Arguably akin (distantly akin, I admit) to paintings on black velvet, these scrimshaw memorial pieces were conceived by whalers' romantic interpretations of the heroes of their day as glorified in death, with an eye to possible financial remuneration. Left: for Commander Stephen Decatur, naval hero of the War of 1812, mortally wounded in a duel in 1820; Center: for George Washington; Right: for Major-General Joseph Warren, a patriot killed at the Battle of Bunker Hill in 1775. 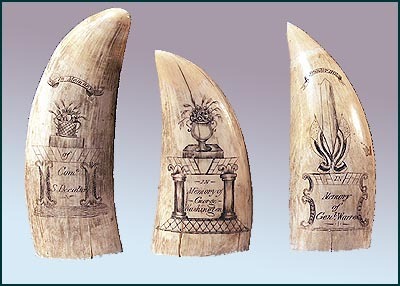 Though the obelisk was a widely used mourning motif, like the urn, it is possible that the obelisk on this particular whale tooth is the actual monument at Bunker Hill, which was dedicated in 1843. 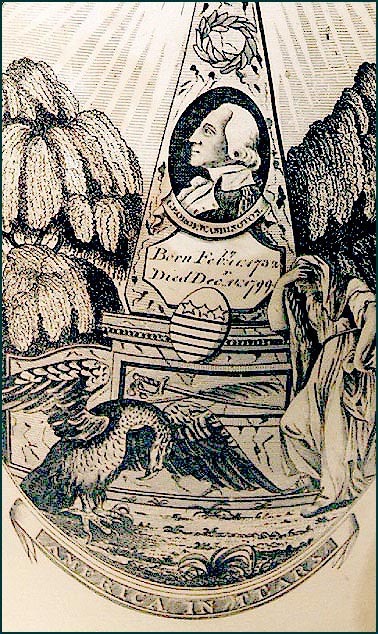 "Washington in Glory, America in Tears" brackets this transfer print in glorious memory of the great man, surrounded by weepers: weeping willows, weeping Columbia, weeping eagle. "This is the hair of Alice Flora Trott who died April 10th, 1850 aged 8 years, 5 months and a half. [signed] her mother." 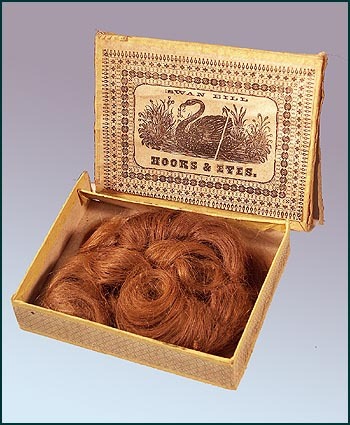 So runs a penciled note tucked within this sewing notions box under the arresting auburn locks. 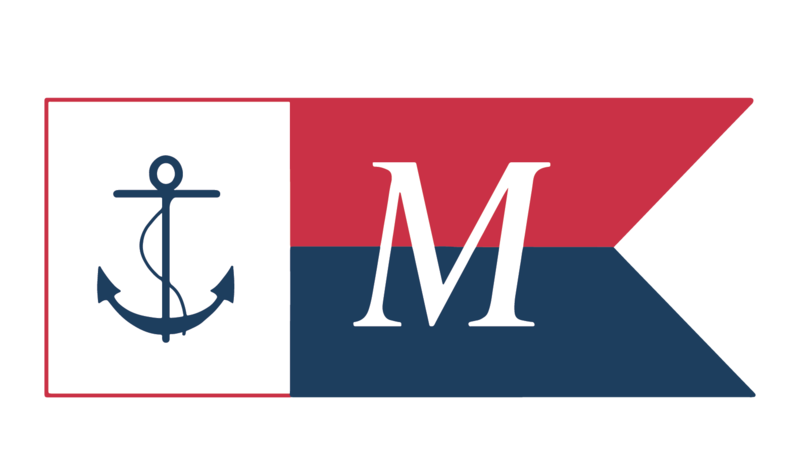 Her mother was Jane Baker Trott; her father was Mitchell Loring Trott, a Bath born ship-master employed in the earlier years of the Sewall family shipping dynasty. They married in November of 1837. When Alice was born in 1842, her father was in the midst of a four year command of the newly built ship Ville de Paris; whether he was away for his daughter's birth or if she was born aboard, we have no record. 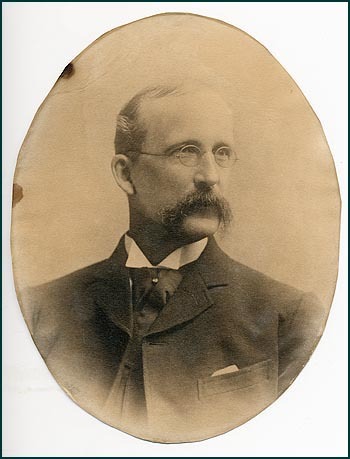 Trott was entrusted with at least seven new vessels from several Bath owners over a twenty year career; between-times he may likely have commanded others that were not new, though this record is harder to fathom. At any rate, the odds were that he was not in Bath when Alice succumbed to measles in 1850. The humble paste-board box is far removed from the formal mourning rituals of the day, and speaks, as does the careful reckoning of the child's brief life-span in the note, to the very private cruel grief of a mother alone. Both parents eventually shared the same burial plot as daughter Alice in Bath's Oak Grove Cemetery, over thirty years later.